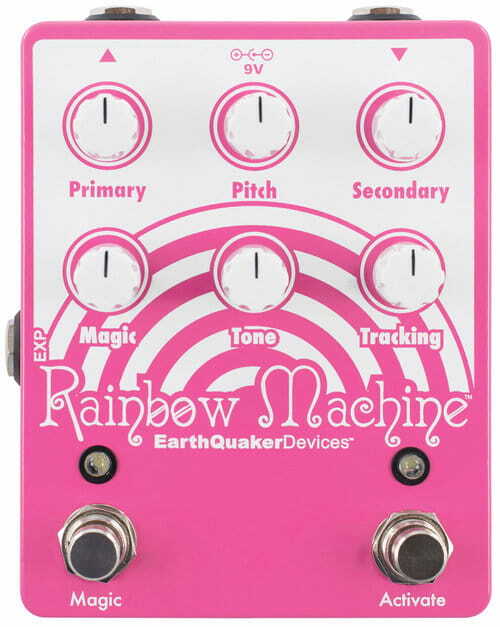 The Rainbow Machine has been completely re-imagineered from the pixie dust-covered ground up to be more versatile, twice as loud as the original, with an extended delay time, deeper chorus tones, silent flexiswitch footswitches on both the Activate (1) and Magic (2) functions, and most of all, more Magic. The Rainbow Machine is built around a DSP pitch warping engine that’s designed to be slightly imperfect; colored with digital remnants of the cosmic dust we’ve picked up across the multiverse. That is to say it’s a cold digital beast made to pretend it has feelings. The Pitch (3) control adjusts the frequency of the polyphonic pitch-warped harmony from a fourth below your input, to a third above, and every atonal pitch in-between. Noon is the unison position. Pitch may also be controlled via expression pedal. 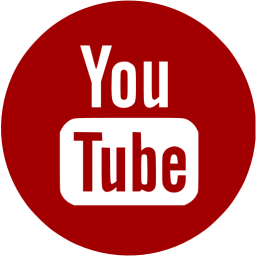 Use the Primary (4) function control to adjust the volume of the polyphonic harmony. The Tracking (5) control adjusts the lag time between the wet and dry signals. Tone (6) rolls off some treble for a darker, “vintage” sound. Clockwise Tone settings are bright, counterclockwise is dark. The Secondary (7) control adds an octave of the Primary harmony. When the Pitch control is above noon, Secondary adds an octave above the harmony. When the Pitch control is below noon, the Secondary control will add one octave below the harmony. With the Pitch set to noon, the Secondary control adds an additional chorus voice for modulated, triple-tracked tones. Use this control to blend in faux-shimmer sounds or a low-frequency rumble. It’s up to you. From there, it’s only a matter of how weird you wanna get. And you can choose how weird you get with the Magic (8) control. 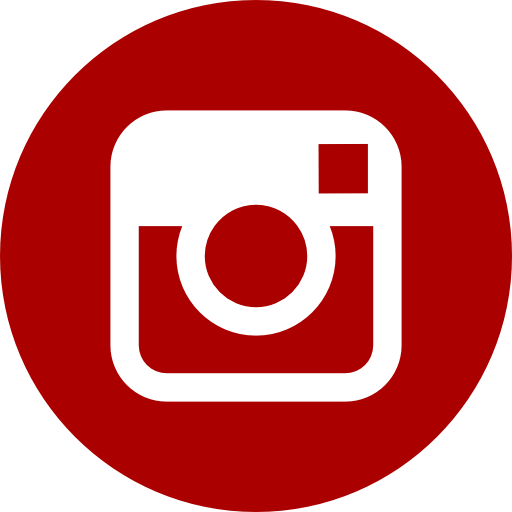 This is a regeneration control that creates aliasing (among other things) by feeding the Primary and Secondary signals back on themselves and each other, and a bunch of other stuff no one understands. With the Magic engaged and the control set low, you can squeeze a few extra repeats out of whatever setting you happen to be using. As you increase the Magic control, you’ll start noticing increased ambience, resonant, edge-of-oscillation pitch-shifting delays, chorus, metallic digi-flanging, ascending (or descending) pixie trails, controllable self-oscillation, squalls of synthetic noise, whale song, and finally, distortion. It’ll take you way beyond and open up your third eye, trust us. In conjunction with the Tracking control, the Magic creates wild pitch take offs and descends, chaos chorusing, shrieks, groans, gurgles, wizard-blessed wizardry, signal transformation, imminent destruction, and other general mayhem. Maybe you only wanna get weird for a second? Okay, with the Rainbow Machine engaged, hold down the Magic footswitch, get weird, and then let go to return to your boring, old Magic-less guitar tone. Or, press the switch like normal, and the Magic remains engaged until you press the switch again. Ditto for the Activate switch. Press and hold to use the Rainbow Machine as a momentary effect, then let go to bypass; or feel free to press the switch like normal and use the Rainbow Machine like you would any other effects pedal. This is an expression pedal control jack for the pitch. 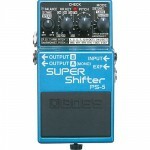 The Pitch control is defeated when an expression pedal is inserted. We recommend the Moog EP-2 or EP-3 for use with the Rainbow Machine and cannot guarantee that any others will work. You did it! 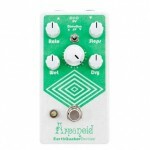 The Arpanoid is the first dedicated compact polyphonic pitch arpeggiator effects pedal for the electric guitar! Great job. Pigtronix Ringmaster is a ring modulator synth designed to create analog harmonizer and tremolo effects that can be made to follow the notes you play.